If you are here after receiving a copy of "Safe In the Arms of God" by John MacArthur, we want to welcome you! We are praying for you. Our hearts ache for the loss of your little one. 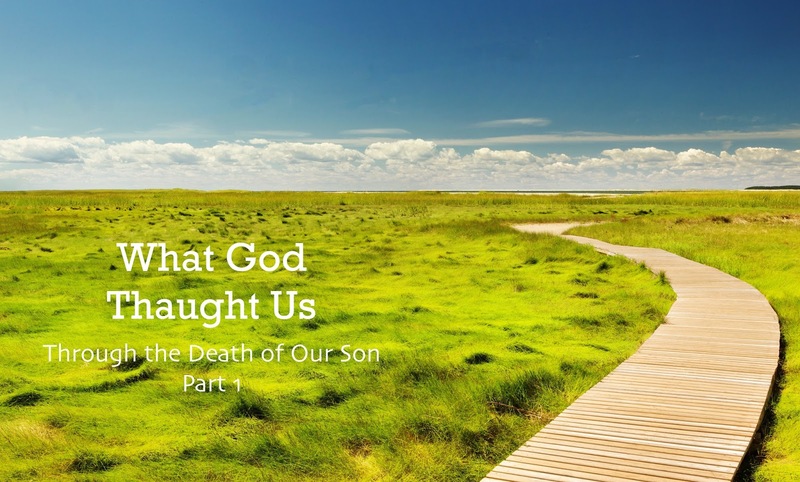 We pray that this blog will be a help to you as you walk this new hard road. We will occasionally be putting new posts up that we hope will be helpful. We will even have some guest writers that we hope you will enjoy! There will be stories from others who have walked similar roads and how the Lord has helped them. This blog was made in memory of our son, Mason Fritz. Mason was born 13 weeks early on June 16th 2010, and due to a severe genetic disorder, was with us for only four days. He joined our Lord and Savior Jesus in heaven on June 20th. To hear more about Mason's story click here. It is our prayer that this blog will be a source of comfort and encouragement to others who have experienced the loss of a baby, whether your baby lived a short life, or just lived in the womb and was lost through a miscarriage, a stillbirth, or by any other means. The message you'll find here will probably be different from what you'd find on most other sites like this. It may challenge your thinking regarding life, death, God and the Bible. Please examine the Bible for yourself and find comfort and truth in the strength of God's Word. If you do not already have a copy of "Safe In the Arms of God" and have recently lost a baby, please contact us. We would love to hear about your little one and send you a copy of this helpful book. Last year in August we shared a video of a precious baby boy named Ezra Blaze. In that video his mother shared a line from a song. I wanted to share the whole song with you today. These wonderful words are based on Psalm 130. This song was written by Bob Kauflin and is from the album Psalms. I pray that this will be your prayer today, that your hope would be in the cross in every trial and loss! Once you have a loved one in heaven, you begin thinking about heaven in a new way. After Mason's death I wanted to know more. What does the Bible tell us about heaven? What truths could I rest on now that someone who holds such a special place in my heart is in heaven? I am very thankful for "Safe in the Arms of God" and the books written by Randy Alcorn on heaven. These books helped Chris and I, and our children, learn how wonderful heaven will be and they've helped us to look forward to the time when we will once again will be reunited with Mason. It is a joy to know that Mason is in heaven, free from this world of sin, living with our Lord and Savior, Jesus Christ. Death exists because sin exists. Our real enemy is sin, Satan, hell, and death, and Christ is the only one who can conquer these terrible enemies. God's Grace comes to us in many forms (His Word, His Spirit, friends, family, etc) and He is sufficient to provide all that we need to live a life that glorifies Him. When you lose a loved one there are many raw emotions. How each person mourns a loss is going to look different from person to person. I remember during the 4 days that Mason was with us, and the weeks following his death, that the hardest time for me was at night, before going to sleep, and early morning, when I woke up. There were many tears shed during those hours. I know that for Chris it was really hard the first time he did things agin: The first time he went back to work, the first time back to church, the first time leading worship, etc. For me it was hard, as time went on, that Mason no longer filled my every thought. I knew how to love my girls, who were a part of my daily life, but how do I love this baby, who I love so much and who is no longer a part of my daily life? It was hard to let go of him and return to life without him. This mourning process is going to look different for each person. It is not wrong to cry a lot, it is not wrong to need time alone, it is not wrong to need time to think and sort everything through. I would encourage you, in your grief, to keep clinging to the Lord and the truth in His word. I would also encourage you, if you are married, to not let this loss push you away from your spouse. You need to help and encourage each other during this time; you need the love and support you will find in one another. Each year on Mason's birthday we try to do something special to remember him. We enjoy letting the girls plan out what we are going to do. Each birthday has looked a little different, but each year we take time to look through his photo album and go through all the items in his memory box. Thank you for taking the time to read this post. We pray that as you walk this hard road of loss you will be drawn to Christ and find rest and hope in him. In the days after our son's birth and death we received an outpouring of love and help from our church family. We had visitors at the hospital, cards sent to us, meals prepared, flowers delivered, and our lawn mowed. It was a joy to experience the hands and feet of Christ at work in our local church body! Everyone's love and support was such a blessing to us as we moved through the days and weeks following Mason's death. Over the last 6 years the Lord has brought many wonderful opportunities for us to share our faith in Christ. Many of these opportunities grew from something that started to develop in the months following Mason's death. When we left the hospital, we were given a bag with some flyers and a picture book. This bag, and the items in it, were given by the hospital to every family who has lost a baby at the hospital. After leaving the hospital, I also started reading "Safe in the arms of God" by John MacArthur. This book was a wonderful blessing to me. As time went on I started to think how neat it would be to provide the hospital with copies of "Safe in the Arms of God" to include in their bags, but I was not sure how this would happen. Would they even be interested in a book that is so clearly based on Biblical truth? I also was not sure how we would come up with the money to purchase these books. I talked to Chris about this idea and asked if he would write to the nurse who was over St. Vincent's grief counseling program. I could tell that Chris did not want to, but he agreed to write the letter. We were surprised to hear back from the nurse that she was very open to the idea. We came to learn that many of the nurses who help families, who have lost babies, are desperate for a way to help these families. There is really no hope, but that of heaven, that they can offer to these families. We found out that St. Vincent's hospital could use 120 books to give away in the year to come. The Lord was so faithful to provide those 120 books through a donation from John MacArthur, through Grace to You. This outreach then grew into "4 Days To Eternity". As of today, through 4 Days to Eternity, we are now donating books to 7 hospitals and 4 funeral homes in the Indianapolis and surrounding areas. Thanks to the generous donations of many people, we have been able to donate well over 650 books. There have also been numerous other opportunities to share our story and our hope in Christ. If we are available and willing, the Lord will provide His children with opportunities to share and encourage others. When you are mourning the loss of a loved one, continue to look outward and be attentive to the needs of others. Do not allow yourself to become self-centered and self-focused. The truth is that there are lots of hurting people out there and God may use you to bless and encourage them. In your loss, God may grant you wonderful opportunities to love and help others. Many times as we approach the holiday season our minds can be filled with many wonderful memories and anticipation as we approach the special days that will be filled with family, friends and the many wonderful memories that will be made. For those of us who have lost a little one this season can also remind us of the hurt and emptiness that our hearts feel as we know that our little one will not be apart of the coming holidays. How can we move through these months and still have joy? How does the Lord want us to handle these hard emotions and feelings? Carolyn Mahaney gives us a great reminder in this post she wrote titled "Rejoicing in Suffering at Christmas". Please click on this link and read her wise words for us all. It is our prayer that her wisdom will help guide you through the coming months. Today we have a 2 beautiful video clips to share with you. These video clips are about Ezra Blaize, a precious baby boy. In the first clip his parents are sharing at his funeral about his 54 day life, sharing what they have learned through his life. They so beautifully share their trust in the Lord, where they find their comfort during this hard time, and what they have learned from his life. In the second clip, his parents share more of Ezra's story and their hope in the Lord. Please take a few minutes to watch these touching videos! Welcome to 4 Day To Eternity! 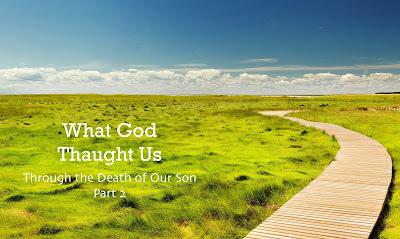 It is our pray that you will be blessed by the contents of this blog. You can support 4 Day to Eternity finically without even spending any money. If you do your Amazon shopping through our affiliate link bellow we will receive a percentage of your purchase. Follow the link and bookmark it. Then use the booked marked link when you make a purchases. All money we receive will go towards purchasing more copies of "Safe In the Arms of God". to those who are called according to His purpose."